I read this authors debut novel, House Broken, and enjoyed it so much I really wanted to try this this author’s next book, The Middle of Somewhere, even though I was concerned the subject was about hiking. 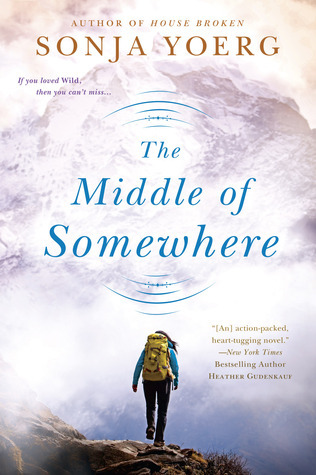 I don’t know a lot about hiking, and all I really remembered about hiking is from doing it when I was very young during the summer camp I used to attend (one of my favorite memories is eating the granola mix this character, Liz, talks about in this book! My blend had M&M's in it!) Having that little bit of hiking experience is what intrigued me about this book, but how was this author going to fill an entire book about it hiking I wondered? As I was reading along, I found I could not stop reading this book! This author's writing had me hooked and it read with such ease and enjoyment. I 'had' to keep reading more. Later, at the end of the book, I learned this author has hiked this trail before, so this story was one written out of the love of hiking. We get to watch the characters Liz and Dante go into the park together to hike the JMT (John Muir Trail) trail for about three weeks, and a certain distance every day or they'll run out of food. This is a serious hike, but enjoyable for those who like to do this. They hike like crazy, hike out their problems, work on their problems, problems they had individually and together, come up with ideas, etc. Throw in a few bad people who can't keep things nice without hurting others, and an excellent story/adventure came out of this book! Highly recommend! You'll definitely have a change of pace with this book! I want to thank the author, Sonja Yoerg, and Penguin for supplying me with a completed book for review purposes!